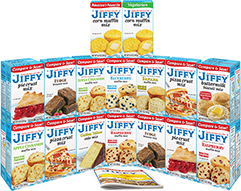 Enjoy the convenience of our "JIFFY" Mix Online Store and have your favorite "JIFFY" mixes delivered directly to your home. We ship via UPS anywhere in the Continental U.S.A.
please call us at 1-800-727-2460, Monday-Friday 8:00AM to 4:30PM ET. Orders received after 12:00PM ET will ship the next business day. Due to recent maintenance, some users may need to reset their password. If you experience issues when attempting to log into the system, please reset your password using our Forgot Your Password? link below. If you have any questions, or require assistance in resetting your password, you may call one of our helpful consumer relations representatives at 1-800-727-2460, Mon. - Fri. between the hours of 8:00AM - 4:30PM ET.